Calling all fans of the world’s most famous wizard, this private 8-hour tour takes you to sites used to film the Harry Potter movies. Departing London in a vehicle equipped with Wi-Fi, you’ll travel to Oxford to visit Christchurch College, home to the Great Hall, Grand Staircase, and Hogwarts Library. Plus, you’ll explore the village of Lacock, where Lacock Abbey features classrooms, cottages, and corridors used in the movies. Refreshments and hotel pickup and drop-off are included. We thoroughly enjoyed our day trip out to Oxford and Lacock. We booked it for our first full day of our trip, thinking that we could recover from jet lag/travel fatigue while riding around in the countryside in a car, and this turned out to be a pretty good plan. Our tour guide/driver, Douglas, was very knowledgable and engaging, and thank goodness, because we ended up spending a lot of time with him more on that below. Highlights of the day include the Bodleian Library truly amazing and the charming Lacock Village. All in all, we spent a lovely day visiting sites that we probably would not have done on our own, so the tour made it possible. I have one caveat and one criticism that I hope Viator will fix in the future. Caveat: Although the theme of the day is Harry Potter sites, and we did start the day at the Kings Cross Station touristy, but fun and they have props and a photographer right there to take pictures so they turn out well, this tour is quite different from doing a studio tour. 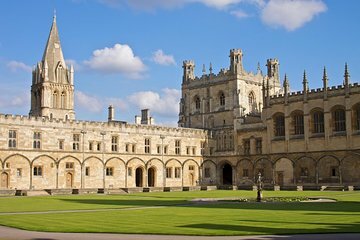 At Oxford and Lacock there are certainly references made to Harry Potter and also Alice in Wonderland at Christ Church, but these are sites that boast their own significance. In fact, I was concerned that my kids ages 14 and 11 were going to suspect me of trying to pass off an educational experience under the guise of Harry Potter. As it turned out, the kids LOVED the Bodleian Library. The docent did an amazing job on the short and sweet 30-minute tour of setting the historical context and on-going importance of one of the oldest libraries in Europe and the 2nd largest in England, so much so that they pushed to do a quick stop at the Weston Library to see a copy of the Magna Carta believe me, none more surprised than I. Lacock Village is lovely, featuring a hodgepodge of thatched roof buildings and winding cobblestone roads in addition to the abbey itself Hogwarts, which is viewable at a distance. One really gets a sense of the English property system as featured in Downton Abbey and that it really hasnt changed a bit. Local residents of Lacock are taking advantage of the HP tourism and several have homemade items on offer in their front yards jams, meringues, seed starts, HP talismans, which my city-dweller kids found quaint and irresistable. Criticism: The Bodleian Library and Christ Church both require tickets and Viator did not purchase/arrange these ahead of time. This caused a big hassle and major delays for us. We arrived at the Bodleian around noon, but the next available tour was not until 3:30 We called our guide/driver to come back and get us, and we decided to go to Christ Church first. Unfortunately, when we got to Christ Church we discovered that the Great Hall was closed for lunch until 2:15 So we killed some time, ate lunch, and then commenced. As a result, though, we didnt leave Oxford till after 4PM, dramatically extending our day. We had planned to get back to London around 6:30, but with the delays and traffic, and even skipping a planned dinner stop in Lacock, we did not get back until 10PM Douglas helped us call in a takeout fish and chips order, which was terrific! It was a long day. Especially considering the price of the tour and that its a private tour Viator has advance notice of the date and participants, Viator should purchase the tickets ahead of time and confirm open hours. Also, note that minimum age for the Bodleian Library is 11. In the end, we were glad to spend the day roaming around and let someone else do the driving. And we probably would not have prioritized Oxford and Lacock on our own, so all in all, we had a great day and would recommend seeing these sites this way.